Bamboos evoke an exotic atmosphere wherever they are used - unfortunately, they are too often kept out of our gardens for fear of their invasive qualities or lack of hardiness. In truth, these elegant grasses, encompassing both woody and herbaceous forms, can achieve dramatic yet restrained effects in a range of climates. Their uses include both the ornamental, offering striking foliage and culms, and the practical, such as for screening or erosion control, not to mention the culinary treat of bamboo shoots and the structural qualities of the culm wood. Tropical and subtropical bamboos present many possibilities for landscapes in warmer climates, while the hardier species can be grown as far north as Minnesota in the United States and in the cooler climes of England and continental Europe. Bamboo culture has a long and distinguished legacy in East Asia, but much remains to be explored by Western gardeners and landscapers. 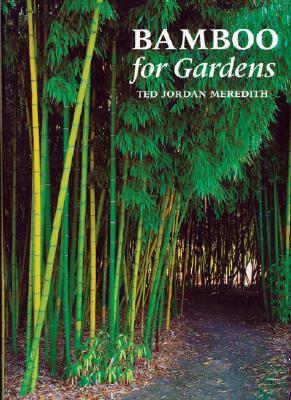 Bamboo expert Ted Jordan Meredith provides a thorough and multifaceted treatment of these ancient grasses, covering origins and history, structure and form, cultivation and propagation, landscaping, and taxonomy and identification. He offers insight into selecting the right plant for the right situation, and presents useful advice on the best methods for containing or eradicating potentially invasive forms. The bulk of the book is an encyclopedia of bamboo genera, species, and cultivars. More than 300 bamboos from 40 different genera are described in detail, including information on size, lighting and temperature requirements, native range, physical characteristics, and landscape and other uses. Meredith's excellent color photos and clear line drawings effectively illustrate both the details and broader effects of these exquisite plants.